Wearable tech, from Google Glass to PUSH, has garnered plenty of attention in the tech industry. It’s clear that what makes wearables so fascinating is their potential to disrupt how we live our everyday lives. With the entrance of the much-anticipated Apple Watch into the market, the wearables industry is expected to grow even more in the consumer market. In many ways, the industry is at a precipice. It’s beyond its days as the ‘hot new thing’ but still new enough that wearables have not yet been adopted on a mass scale. So what does the future of wearables look like? We asked Tom Emrich, wearables expert and the founder of We Are Wearables, to get his predictions. Broadly speaking, what is the future of wearables? The future of wearables lies in breaking us free from the chains we have with our current tech. We have become addicted to our computing devices so much that we have created an imbalance in our use of smartphones and computers versus engaging and living in the present moment. There’s no doubt they are powerful tools that have elevated our ability to communicate, connect and perform but we have become a slave to these devices. The end game for wearables is to integrate our technology with our lives in a way that creates a more balanced relationship. This would move tech into the background so that it enhances rather than distracts us from life. The leap to wearable technology marks the age of awareness, where technology has been given the ability to be aware of its surroundings mainly through things like sensors. Prior to this stage of computing, we were in the age of information, where computers learned only from the data we fed them. The awareness stage is an important one, but for us to realize a truly integrated experience with our tech, it needs to reach the age of intelligence, where it uses the information its been fed and the awareness it has gained to make its own decisions and add value to our lives. 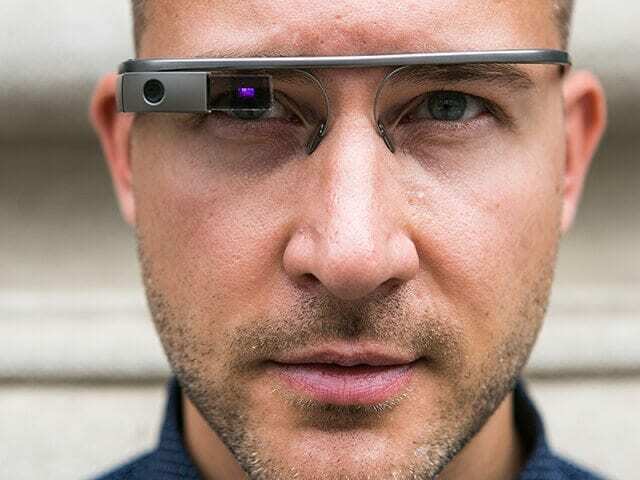 Tom Emrich wears Google Glass. How is the wearable tech experience different from other gadgets we have? Up until now our relationship with technology has been a relatively separate one. We started with computers at our desk that we had to go and visit to use. Then, with PDAs, cellphones, smartphones and tablets, we mobilized our tech and were able to bring it with us out of our homes. But even though our smartphone offers a more intimate relationship than a computer because it is always with us, it is still separate. We have to take our phone out of our pocket or purse and hold it in our hands and use it. This separation causes a couple of things. It doesn’t allow our technology to know anything about ourselves unless we explicitly tell it through our actions online. It distracts us from the present moment, forcing us to divide our attention between a digital need and our physical environment. It also has no capacity to enhance our physical capabilities such as our senses or ability to walk. Wearable technology is a huge step in closing this gap. Now that wearables have sensors that are passively gathering information about our physical selves when they are worn, our tech will start to be aware of who we are without us needing to take action online. And as wearables start to move our tech into the background, it will lessen the distraction and start to marry the digital moment with the physical one, allowing us to focus on what is happening right in front of us. Finally, as wearables have access to our body parts, they will start to augment our physical capabilities. We have already seen devices that are helping the nearly blind see and allowing those who can’t walk, to walk. Within the three categories of wearables (complex accessories, smart accessories and smart wearables), which will be the most popular and why? This category contains the lowest-priced devices on the market. A Fitbit sells for $60+ whereas a smart accessory like a smartwatch starts at $150. In addition, the devices in this category have a clearer value proposition: our health. All of us want to lead healthy, fit lives and technology that promises to help us achieve this will always be well received. But as we get more comfortable with wearables and as the technology matures and the devices get more wearable, I suspect that the other categories will catch up, if not surpass, complex accessories in popularity and market share. Emrich says wearable technology is a huge step in closing the gap between our physical and digital world. Which industry sectors do you see having the most benefit from wearables? It really depends on the device, as not all wearables are the same, but in general, health and enterprise are the two sectors we are seeing the most success this early on. Google’s journey with Glass sheds some light on the industries that are seeing success in leveraging wearable technology. We’ve seen surgeons be able to better operate, medical students provided an elevated learning experience and first responders able to act more quickly because they have the information they need readily available on this heads-up display. But we have also seen field workers, solar panel roofers and even miners benefit from a computer that allows them to interact with it hands-free. What needs to happen to make wearables everyday accessories for the average consumer? Two things will drive the success of wearable technology: user value and fashion. Wearable tech companies need to hit a consumer nerve with their products and must demonstrate how this technology will benefit those who choose to invest in it. In addition, these devices need to be stylish and fashionable in order to be worn. Companies creating wearable devices need to keep designing their products around solving a real problem for people. Keeping the user top of mind is necessary for success.